The Turban Coral, a favorite of all the Turbinaria, loves to extend its polyps both day and night! The handsome Turban Coral Turbinaria peltata is a definite favorite from the Turbinaria genus. The corallites of its skeletal structure are knobby as opposed to an 'ant hill' tubular type, and they are close together. 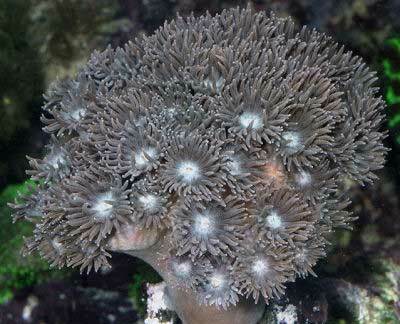 Its polyps are big and frilly, covering the underlying skeleton so well that the coral almost looks furry. A coral you may see at the stores may not have as many polyps, due to lack of feeding, yet they are still quite large making it easy to identify. After feeding as needed, the polyp numbers will exploded, making it one of your favorite corals. The Turbinaria species take on various characteristic shapes depending on the depth at which they are found. They will robustly change shape with a change in environment. If one were to transplant a shallow dwelling species to deeper levels, or visa versa, they will actually change shape to make the most out of the lighting in each habitat. Turban Corals T. peltata are typically sold in the "cup" form, yet again depending on the depth that they are captured, they can become columnar in shape. The characteristic Turbinaria shapes are reflected in the Turban Coral's other common names including Cup Coral, Pagoda Cup Coral, Green Cup Coral, Chalice Coral, Column Coral, Bowl Coral, Octopus Coral, Plate Coral, Vase Coral, Disk Coral, Platter Coral, and Saucer Coral. Besides having various shapes, Turbinaria corals also have variations in their polyps. One side of any plate or column generally has polyps or at least tissue coverage. The Turban Coral has large fleshy polyps with calices (opening of the corallite) that are 3 to 5 mm in diameter. The color of the T. peltata can be brown, yellow, gray, and greenish gray blue with some cream. The Turbinaria corals are much sought after for reef aquariums. Depending on the variety, Turbinaria species can be grouped as small polyp stony (SPS) corals or as large polyp stony (LPS) corals. T. peltata has calices (opening of the corallite) that are 3 to 5 mm in diameter, so they are most often grouped as an LPS coral. Others, such as the Yellow Cup Coral Turbinaria frondens, which has much smaller polyps with its calices being only 1.5 to 2.5 mm in diameter, are most often grouped as an SPS corals, though this can vary. Either way, the Turbinaria polyp expansion is a great indicator of the overall health of the aquarium, thus a great addition to most systems. The Turban Coral is a great beginner's coral that delivers a high satisfaction rating. It is one of the easiest Turbinaria species to maintain in an aquarium with good lighting and water quality. Yet it doesn't need high lighting or special considerations. It just needs some water moving across it to help remove wastes. It also doesn't grow super fast, so won't outgrow its tank any time soon. Turbinaria corals are mostly friendly towards other corals, making them a popular choice with all levels of reef enthusiasts. They do have polyps, that when irritated can produce a hefty mucus net. If this mucus comes in contact with other corals, it can damage them. They have been known to reproduce in captivity, and captive bred specimens are generally more healthy and easier to maintain than wild caught. One of many from the Turbinaria genus, the peltata species is also known as the Pagoda Cup Coral. They are big eaters! This video shows a well fed specimen as shown by it's many polyps. The better fed, the more polyps appear. Fragging is best done with a band or electric saw for an even cut. This is one of the best beginner corals, yet it is cherished by intermediate and advanced aquarists alike. The Turban or Pagoda Cup Coral, T. peltata is a great beginner coral. They form a rounded, slightly cupped shape and are hungry corals. The more they are fed the more tentacles appear. This one needs a little more care. No doubt the aquarist just bought this from the store and it will soon be fed daily and will form many new polyps! These corals are one of reef building species, so their importance in the wild cannot be over emphasized. They are easy to frag and propagate for the most part. Probably the most common color, this seafoam green with tannish tentacles is what is seen at fish stores more so than other colors. This formation is actually legit! While they are known as a Pagoda Cup Coral, looks like this one took the name "Turban" quite seriously! This columnar shape in the middle was formed due to this tanks specific water movement and light. They are quite adaptable and will change shape with lighting and water movement. With the potential to grow 3 feet across, a minimum tank size would be about 100 gallons. Distribution / Background Turbinaria Coral Information: The Turbinaria genus was described by Oken in 1815. According to author Vernon in his book "Corals of Australia and the Indo-Pacific", there are 80 nominal species, with 10 true species from Australia. There are currently 30 recognized species in this genus, yet the most commonly purchased and imported are the Scroll Coral T. reniformis, Yellow Cup Coral T. frondens, Pagoda Coral T. mesenterina, Cup Coral T. patula, Turban Coral T. peltata, and Disc Coral T. bifrons. The Turbinaria genus is considered one of a few of the hermatypic or "reef building" corals, and are only one of the three reef-building genera in the Dendrophylliidae family. Turbinaria are also the only genus in this family that are symbiotic, meaning they live in symbiosis with a marine algae known as zooxanthellae, from which they derive some of their nutrients. Unique to Turbinaria is the ability to have a variety of shapes, depending on the depth at which they are found. They will actually change shape to make the most out of the lighting in each habitat. Specimens found at deeper levels have a different appearance than the same animal found in shallower water with brighter lighting. Consequently common names are sometimes used interchangeably between species. Common names the Turbinaria genus are known for are Turban Coral, Cup Coral, Scroll Coral, Yellow Scroll Coral, Yellow Cup Coral, Pagoda Coral, Vase Coral, and Chalice Coral. The Turban Coral Turbinaria peltata was described by Dana in 1846. Other common names they are known for are Cup Coral, Pagoda Cup Coral, Green Cup Coral, Chalice Coral, Column Coral, Bowl Coral, Octopus Coral, Plate Coral, Vase Coral, Disk Coral, Platter Coral, and Saucer Coral. Turbinaria corals have been reproduced in captivity, and there are plenty of captive grown corals to choose from. Captive bred specimens are generally more healthy and easier to maintain than wild caught. Where Turbinaria Corals Are Found: The T. peltata are found in the Indo-Pacific Ocean, Indian Ocean, Eastern Africa and around Australia in the Great Barrier Reef, Coral Sea, Lord Howe Island, Solitary Islands, and Cape Naturaliste. Turbinaria Coral Habitat: The T. peltata are found at depths from 0 to 131 feet (0 - 40 m) on shallow reef slopes and foreshores that are protected and have turbid water. Status The T. peltata is not on the IUCN Red List of Endangered Species. Description What do Turbinaria Corals look like: The T. peltata has a lightweight skeletal structure and there are a variety of shapes, depending on the depth where they are found. They are typically sold in the "cup" form, yet again this depends on the depth that they are captured. They can become columnar in shape so that all available light is utilized. The corallites are knobby as opposed to an 'ant hill' tubular type. They are close together with calices (opening of the corallite) that are 3 to 5 mm in diameter. The polyps of the Turban Coral are big and frilly, covering the underlying skeleton so well that the coral almost looks furry. They use their polyps to capture and eat larger foods. A coral you may see at the stores may not have as many polyps, due to lack of feeding, yet they are still quite large as far as the polyp is concerned and easy to identify. The polyps also use mucus secretions to both capture food and get rid of waste. Their colors can be brown, yellow, gray, and greenish gray blue with some cream.. The T. peltata can grow up to 3 feet (91 cm) across. Juveniles are generally shapeless, yet conform to water and light availability. Their life span is unknown. Difficulty of Care Turbinaria Coral Care: The Turbinaria genus is fairly easy to maintain in an aquarium with good lighting and water quality. The T. peltata is one of the easiest species to care for, as are most of the deeper dwelling Turbinaria. They are less demanding with light and water movement. Keeping a medium water movement helps them to get rid of wastes. Their polyp expansion is a great indicator of the overall health of the aquarium. Foods / Feeding Turbinaria Coral Feeding: The Turbinaria genus, like other large polyp stony (LPS) corals, have developed several feeding strategies. Through a symbiotic relationship with a marine algae, known as zooxanthellae, they receive some of their nutrients. Turbinaria are the only genus in the Dendrophylliidae family that are symbiotic.They also capture planktonic organisms, food particles from the water column, and can absorb dissolved organic matter. In captivity, although the Turban Coral relies on lighting for their zooxanthellae, they also need to be fed a variety of other foods. Feed such foods as mysis shrimp, enriched baby brine shrimp, cyclopeeze, and finely minced silversides or other fish from the ocean that you can get at your grocery store. They need to be fed several times a week. Use good sense in determining how often your particular animal needs food. If their polyps start to disappear, then you are not feeding them enough. Aquarium Care Typical water changes of 20% a month, 10% biweekly, or 5% weekly are needed. It has been noted that 5% weekly water changes replenish many of the needed additives. They also benefit from strontium and trace elements. Frequent water changes help to supply trace elements, but with higher concentrations of coral with calcareous skeletons, there may be a need put in additional additives to maintain proper levels for good growth. Calcium: 385 to 425 ppm. If a large poly stony (LPS) coral does not have enough calcium, it will not grow. Magnesium: 1350 minimum. Magnesium makes calcium available, so if your calcium is low, check your magnesium levels before adding any more calcium. Aquarium Parameters A live rock/reef environment with a sandy substrate is what is needed for your Turban Coral, along with some fish for organic matter production. A mature tank is recommended. Be sure to have proper water movement and provide sufficient lighting. Turbinaria species can be tolerant of several lighting conditions, though a moderate light is preferred. Along with adequate lighting, provide a moderate and turbid, or a surging water movement for the best health. This is a peaceful species, but other corals may not be, so provide adequate space between species. Compatibility and Social Behaviors The T. peltata is peaceful towards other corals. However, if their polyps become irritated, they can produce a hefty mucus net. If this mucus comes in contact with other corals, it can damage them. So they do need adequate space between themselves and other corals. Yellow Cup Corals do well in a mixed reef, a small polyp stony (SPS) coral tank, or a large polyp stony (LPS) coral tank. They do need to be kept away from contact with polyps of Zoanthid corals, and away from the sweeper tentacles of other corals. They are safe with reef safe fish, yet do not like to be walked on, sat on, or otherwise pestered by any kind of crab. Breeding and Reproduction The large polyp stony (LPS) corals are hermaphrodites, male and female within the same organism, and can reproduce both sexually and asexually. In the wild they reproduce sexually by releasing eggs and sperm at the same time, resulting in a fertilized egg which then forms into a free-swimming planula larva. Eventually the planula larvae settles onto the substrate, becoming plankters. This then forms a tiny polyp which begins to excrete calcium carbonate and develops into a coral. Planula larvae are extremely vulnerable to predation, and very few survive. The Turbinaria genus can reproduce asexually as well, by fragmentation or extratentacular budding. In captivity, propagating the T. peltata is fairly easy through fragmenting. Coral farmers may use sexual reproduction to propagate in the future, as it has been successful. To frag, first start with a healthy coral. The best choice for cutting this coral is an electric saw. Once cut the frag should be left on its side, keeping the cut or wound completely open to water flow so it can heal. If the wound is face down, there would not be enough water flow and the cut area can get infected. They may not look pretty when you frag them, but they quickly start to grow into beautiful cups, scrolls, or whatever shape your environment encourages them to form. Give the frags a chance to heal before moving them to a new tank. Potential Problems The T. peltata are attractive and durable when their needs are provided for. They have mucus secretions that they use to capture food or get rid of waste. The only time an aquarist should worry is if the actual tissue looks unhealthy under the mucus. Availability Turbinaria Corals for Sale: The T. peltata is very easy to find at pet shops and on line. Online they can run about $34.00 USD or more depending on size and/or color.